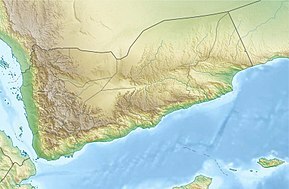 The Battle of Al Hudaydah (Arabic: معركة الحديدة‎, translit. Ma‘rakat al-Hudaydah), codenamed as Operation Golden Victory, is a major Saudi-led coalition assault on the port city of Al Hudaydah in Yemen. It is spearheaded by the United Arab Emirates and Saudi Arabia and has been considered as the largest battle since the start of Saudi Arabian-led intervention in Yemen in 2015. Battle resumed on September 9, 2018 after peace talks collapse due to Houthi absence in Geneva peace talks. Beginning on 13 June 2018 and aiming to dislodge Houthi forces from the port, the objective of the assault is to recapture the city of Al Hudaydah and end the alleged supply of funds, weapons, and ballistic missiles to the Houthis through Al Hudaydah port. The Houthis counter by saying that they are defending Yemen from a US backed invasion. As the port plays the crucial role of delivering over 80 percent of food and aid to Yemen, several humanitarian agencies warned of catastrophic humanitarian consequences. The United Nations warned that the battle could threaten the lives of 300,000 children in the populated area and prevent food delivery to millions or more. The UN has made various attempts and efforts to take over the control of Al Hudaydah port from Houthis and move it under its jurisdiction. The Houthis has said they are not against UN role and agreed to grant the UN "a role of supervision" on the condition the coalition withdraw the offensive but said they won't withdraw from the city. Amid international pressure, the coalition promised the strategy of not entering any populated areas of Hudaydah, but work to isolate the Houthis by cutting their supply lines. Multiple reports indicate that the battle has exacerbated the humanitarian situation in Yemen. The UAE had previously proposed a naval attack on Al Hudaydah in 2016, however the United States advised against it as the operation was deemed to be too risky at that time. In the intervening two years, the UAE trained thousands of Yemeni soldiers, positioning them at bases in Eritrea and along Tihamah as part of the offensive on Al Hudaydah Governorate. Al-Hudaydah, is a port city in Yemen located in Al Hudaydah governorate in the western coastline of Yemen. The city is located on the Tihāmah coastal plain which borders the Red Sea. Al-Hudaydah is the largest city by population in Al Hudaydah Governorate. Due to its location, Hudaydah port is one of the important and strategic ports in Yemen. The Yemeni Civil war is an ongoing conflict that began in 2015, closely followed by a Saudi Arabian-led military intervention. The war and blockade by the coalition has led to what the United Nations describes as the "world's worst humanitarian disaster". The port city of Al Hudaydah has played a crucial role in delivering imported food into the country. This role has been disrupted several times over the course of the war. During the 2015 Yemeni Civil War, the Houthi-controlled city's port was bombed by the Saudi-led coalition on 18 August. The port's four cranes were destroyed and several warehouses were damaged. The coalition asserted that the port was housing a hostile naval base, but humanitarian aid organizations stated the coalition's naval blockade was preventing relief from reaching those in need. In early November 2017, in response to a Houthi missile landing in Saudi Arabia, the Saudi authorities closed the port along with all other routes into Yemen. On 23 November 2017, the authorities allowed the port to reopen for aid deliveries, along with the Sana'a International Airport. According to World Health Organization, Hudaida governorate has one of the highest malnutrition rates in the country. Prior to the beginning of the battle, three-quarters of humanitarian and commercial cargo entering Yemen arrived via the port of Al Hudaydah. Due to the risk of a humanitarian crisis if the port is besieged, the United Nations attempted to secure an agreement to manage the port under its jurisdiction and negotiated with the Houthis to take control of the port. The Houthis claiming that they have been cooperating with the international relief efforts to deliver aid to the Yemeni people. The coalition claims that Houthis use the port to raise war economy funds through taxation and smuggling weapons into Yemen, an allegation denied by the Houthis. A week before the start of the battle, the United Nations warned up to 250,000 of the city's 600,000 residents could be in danger. Martin Griffiths, UN peace envoy warned that the assault on Hudaydah would undermine the peace process. UNICEF Executive Director, Henrietta Fore, stated on June 11 that she was "extremely concerned" about reports of a military plan by Arab coalition to capture Hudaida. UN Secretary-General António Guterres, also said that he believed "intense negotiations" by UN representative can prevent start of a war. In a tweet on 15 June, Mohammed Ali al-Houthi, the head of the Yemeni Supreme Revolutionary Committee criticized UN envoy Martin Griffith for failing to negotiate a peace, saying: "the role played by the former UN envoy did not exceed the profession of postman, and his initiative was rejected by the US-Saudi aggression in agreement with the mercenaries who refuse to accept the choice of a consensual person for the presidency." Muhammad Abdel Salam, the Houthi spokesman also stated: "Despite the UN envoy's visit to Sana'a more than once and meeting with Houthi officials for a comprehensive political solution, he has not done anything yet, which appears as a cover for the continuation of aggression." In a statement, UNICEF Executive Director Henrietta H. Fore said the battle will harm 300,000 children who currently live in and around the city. "There are 11 million children in need of humanitarian aid and the attack will lead to choke off this lifeline and have devastating consequences", the statement said. The United Arab Emirates initially stated that it would not attack the port without the support of the United States and the United Kingdom. The United States Government initially expressed concerns about the risks of a battle, though Secretary of State Mike Pompeo and Secretary of Defense James Mattis subsequently offered qualified support. According to Emirati Minister of State for Foreign Affairs Anwar Gargash, the Houthis were warned to evacuate the city within 48 hour and the deadline for Houthi forces to withdraw from Hudaydah expired on the morning of 13 June. The Houthis say that they took power through a popular revolt and are defending Yemen from invasion. Care International's acting country director, Jolien Veldwijk, warned from Sana'a of an even worse human catastrophe. "People are already exhausted, starving, and have no means to cope with any further escalation of war." Mohammed Ali al-Houthi, the head of the Yemeni Supreme Revolutionary Committee, called on all international organizations to take a serious stance on the aggression and the unprecedented threat it poses to the vital port of Hudaydah, reiterating its continued full cooperation with the international relief efforts to deliver aid to all the Yemeni people. United States and other western powers have been criticized by human rights group for supporting Arab coalition airstrikes that have resulted in death of many civilians. France agreed to use minesweepers to clear explosive and sea mines which were placed by the Houthis around Al Hudaydah Port in anticipation of the attack, hence paving a way for the assault. France also sent special forces. According to Al Mayadeen, the forces of the Saudi and UAE operation depend on American support for weapons, gear, and coordinates via satellite, as well as refueling planes and the help of combat experts and retired US officers. In preparation for the war, US officers also supervised the training of 2,000 fighters in Eritrea who arrived at the coasts of Hudayda. Houthis have routinely accused Israel of being involved in the war against Yemen. On 2 June, Houthi spokesman, Muhammad Abd al-Salam said they have documented participation of Israeli planes in the war. He stated that the reason Israel doesn't acknowledge its role is that it does not want cause trouble for the Arab coalition. The coalition intended the battle to be short to avoid causing civilian casualties. The aim was to cut off Houthis supplies and force them to come to the negotiation table. Coalition forces have established a forward operating base at the nearby town of al-Khoka, south of Al Hudaydah. According to Yemeni officials, approximately 2,000 Emirati troops assaulted Al Hudaydah, departing from a UAE naval base in Eritrea. A worker for CARE reported hearing at least 30 airstrikes on the first day of fighting as the city population was caught in a panic. On the first day of the battle, Emirati and coalition forces reportedly moved to capture Hodeida International Airport, approaching within a few miles. On the first day of fighting, 250 Houthi combatants were also reported killed. Almasirah and Houthi spokesman Loai al-Shami claimed that Houthi forces hit a coalition ship with two missiles, though this remains unconfirmed. The Armed Forces of the UAE has reported that four Emirati soldiers died as of 13 June. In an official statement the Houthi-allied Yemeni Marine and Coastal Defense Command expressed its high readiness to counter the offensive on the port, warning of more attacks on the invading naval forces. It also added that there's no concern for civilian ships to reach for Hudayda so long as they stayed committed to international maritime law. It also stressed the Yemeni naval forces' national and religious responsibility in defending Yemen's sovereignty and territorial integrity. The Ansar Allah movement leader, Abdul-Malik Badreddin al-Houthi stated that the United States was the leading player in the attack on Hudayda and that other parties were "tools". He added that Yemenis are fighting "the battle of liberation and resistance, and confront tyranny and arrogance on all fronts". Forces loyal to the internationally recognized Yemeni government claimed on 14 June that they could breach the first line of defence by Houthis defending the city. Medical sources reported that thirty Houthi militants were killed near Hodeida airport along with another nine pro-Hadi soldiers. According to Emirati Ambassador to the United Nations Obeid Salem Al Zaabi, coalition forces reached just 2 km from the city airport. Two Houthi commanders were reported to have been killed in the ensuing battle, and the coalition claims to have discovered "hundreds" of land mines planted by the Houthis to halt the advance of Pro-Hadi and coalition soldiers in Al Hudaydah. The United Arab Emirates issued 10 ships and 3 flights carrying food and aid bound to Al Hudaydah. Yemeni army officials claimed that dozens of its members have been killed mostly by Houthi landmines and roadside bombs planted around the city and disguised as rocks. Houthi official media, Almasirah, claimed death and injury of more than 40 coalition soldiers close to the seashore after being hit by a Houthi Tochka missile which was launched after intelligence gathering by a reconnaissance aircraft. The coalition claimed it was close to capturing Hudayda airport from Houthi control amid clashes outside the airport. The coalition reportedly seized the airport on 16 June and engineers were placed to remove landmines placed around the airport. Al Mayadeen reporters in Yemen initially claimed the pro-Houthi army and Popular Committees had the airport under control. It also reported that the coalition failed in their push for the airport and had to settle in the seashore. Houthis media denied that the airport was under coalition control and claimed that the coalition forces in the seashore were surrounded from three sides blocking reinforcements from reaching them by land. Almasirah, a Houthi media outlet, claimed killing over 40 pro Hadi soldiers by Houthi snipers over the last two days in various fronts. According to The National, captured Houthi POW have indicated that Houthi forced intended to blow up Hodeida International Airport terminals if coalition forces continued their assault to capture it and has planted thousand landmines across the area. Commander of the coalition forces, Tareq Saleh, has indicated that many of captured Houthis were forced to fight in Al Hudaydah, many of whom were coerced into fighting with threats made against their family members if they refused. Houthis claimed to have fired a missile at the Saudi Aramco oil facilities in 'Asir in southwestern Saudi Arabia. Multiple news agencies reported that the coalition captured large areas of Al Hudaydah airport. However Almasirah, pro-Houthi news agency, wrote that numerous attempts by the coalition to take over the airport failed despite mobilization of all the coalition soldiers. Almasirah also reported destruction of all buildings inside the Al Hudaydah airport as a result of coalition's heavy aerial bombings and claimed several "heroic" victories by the pro-Houthi army, citing their advance preparations and intelligence work before the start of the war for their success and citing the destruction of 20 coalition armored vehicles and capture of another 10. Almasirah also reported death of 6 Yemeni civilians including 4 women as a result of coalition on aerial bombings on Al Hudaydah. A claim that was denied by coalition Colonel Turki Al-Malki citing that there was no civilian casualties on the coalition advance on the airport. The coalition accused pro-Houthi militants of breaking international law and placing tanks inside residential areas of Al Hudaydah. Almasirah reported a public statement by a pro-Houthi organization called Southern National Front to Resist the Invasion which protested against recruitment of young southern Yemenis by the UAE to fight against the Houthis, calling on the southern tribes to prevent their children from being sent to fight the Houthis. Mohammed Ali al-Houthi also ordered the Houthi-founded Supreme Political Council to declare amnesty for pro Hadi Yemenis who surrender. Saudi Arabia announced that Yemeni forces captured the airport from Houthi forces, which was again denied by Almasirah. Reports regarding shortage of electricity and water for Al Hudaydah residents continue to rise, and relief workers attribute the water shortage due to damaged pipes caused by Houthi trench digging. Almasirah released video of Houthi forces destroying coalition armored vehicles south of al-Hudaydah airport. On June 23, the United Arab Emirates announced a pause to the military operations and the advance on Al Hudaydah to allow for UN-brokered talks spearheaded by UN envoy to Yemen, Martin Griffiths. A UN peace talk between Yemeni president Hadi and a Houthi delegation was organized to occur in Geneva on September 6 with aims of finding a peaceful resolution on the battle. On August 4, a coalition airstrike was reported to have killed 30 people in a strike conducted near a hospital and Hudaydah fish market, the coalition denied the news source. On August 23, the coalition stated that it foiled a booby-trapped boat attack by Houthis in the Red Sea and blamed the Houthis of bombing the bordering village Al Ghalifqa in Al Duraihmi district with an Iranian-made ballistic missile. On August 31, according to Houthi-run al-Masirah television network report, a Saudi Arabian airstrike attacked three fishing boats in Yemen's western coastline of Hudaydah city, near the island of Uqban. Based on initial reports, 70 fishermen were missed with later reports mentioning the missing of 19 fishermen. On September 9, the peace talk collapsed after Houthis failed to show for 3 consecutive days to start Geneva peace talks on September 6. The Houthis demanded that the UN transfer their wounded to outside Yemen for treatment as a condition to attend the peace talks and stated that the coalition has hindered their departure to Geneva by controlling Yemen's airspace. After the attempted peace talks between Hadi government and Al Houthis collapsed on 9 September, heavy clashes occurred between Pro Hadi and Houthis with local hospital sources claiming 11 pro-Hadi soldiers and 73 Houthi rebels to have been killed. Pro-Hadi forces advanced on Al Hudaydah and seized control of key Houthi supply routes from Al Hudaydah to Sanaa, Kilo 10 and Kilo 16. A Houthi supply commander, Abu Hashem was also reportedly killed in the advance. Houthis denied losing control of kilo 10 and kilo 16 supply routes, stating that the advance on the routes was foiled. Pro-Hadi forces advanced and captured Al Hudaydah University with reports of continued clashes between pro-Hadi and Houthi forces occurring south of the city. One Saudi-led coalition airstrike hit a busy vegetable market in the town of Bayt el-Faqih south of the Hodeida city, killed 19 civilians including two children. On the first of November, the coalition deployed approximately 10,000 additional reinforcements to take part in a new offensive in Al Hudaydah. Over 200 airstrikes were reported around the Hudaydah area, along with intense fighting around the airport and the University of Hodeidah. Geert Cappelaere, UNICEF regional coordinator, described Yemen as "a living hell for children... a living hell for every single boy and girl" citing death of one child every 10 minutes. He further added that "with any assault on Hodedia, we not only fear for the lives of the thousands of children in Hodedia, we also fear for the impact on children and population, particularly those living in the northern part of the country." A Save the Children heath facility was damaged in the fighting. UNICEF reported that fighting had reached "dangerously close" to the Al Thawra hospital. Houthi fighters raided the May 22 Hospital, which they used as a sniper position. Houthis state that the coalition progress is limited. Fighting has been concentrated on and around May 22 Hospital in Al Hudaydah which was targeted by coalitions airstrikes and shelling according to the Houthis. Almasirah reported the coalition targeted the May 22 hospital with multiple airstrikes, damaging the hospital. Houthi Information Minister Abdul Salam Ali Jaber defected to Saudi Arabia, stating during a press conference that he was "forced to work with the coup-led government". During the conference, an unidentified reporter threw a shoe at him and expressed anger at him on behalf of Yemenis for allying with the Houthis and Iranians. Saudi led forces were ordered by the coalition to temporarily halt their offensive against Houthi forces. One airstrike hit a bus outside of the city limits of Hodeidah, killing 7 civilians. Two shells also hit the al-Thawra Hospital, which is the city's only remaining medical facility. Street fighting resumed on 19 November, with gunfights around the city center of Hodeidah and the al-Saleh district. Rebels also claimed to have fired a ballistic missile into Saudi Arabia. The Saudi-led coalition reportedly conducted 10 airstrikes, and one missile was launched at the July 7 District. Fighting continued in the al-Saleh district and along Khamsin Street in the center of Hodeidah. The Houthi-run Almasirah TV channel claimed Houthi forces attacked government forces on the road between Hodeidah and Sanaa. Millions of Yemenis organized by the Houthis, gather in several Yemeni cities, including Hudaida, to commemorate the anniversary of the birth of the Islamic Prophet Muhammad and display national solidarity against the Saudi-US-led aggression. Addressing the crowds via televised speech, Ansar Allah leader, Abdul Malik Al Houthi said that the unjust aggression is attacking the identity, dignity and sovereignty of Yemen and that the people of Yemen reserve the right to self-defense. He also claimed that US support for the Saudi-led war indicates US support for takfiri terrorists too and that "hypocrisy dissipates the Muslim nations’ weight and wealth, and cements US hegemony and arrogance at the global level." According to Press TV, Yemeni Popular Committees claimed to have shot down a Saudi UAV in the 'Asir Region of Saudi Arabia. UN Envoy for Yemen Martin Griffiths arrived in Hodeidah to hold negotiations with Houthi rebels. According to pro-Houthi Saba News Agency, displaced citizens of Hudayda held a rally in Al Mahwit to protest the Saudi-led attacks on Yemen. Saba News Agency reported several aerial attacks and artillery shells by coalition against residential areas in Hudayda. It also reported the downing of two coalition UAVs by a Houthi-allied wing of the Yemeni army. SABA also reported that Houthi fighters had repelled coalition "mercenaries" around Kilo 16. A flight chartered by the United Nations evacuated 50 wounded Houthi fighters to Muscat, Oman for medical treatment, as part of the peace talks. A UN-brokered ceasefire was agreed upon on 13 December 2018, giving both parties 21 days to fully withdraw their troops from the city. A flight chartered by the United Nations evacuated 50 wounded Houthi fighters to Muscat, Oman for medical treatment, as part of the peace talks. In an interview with Al Akhbar Yahya Sari, the spokesman for Houthi-aligned Yemeni army and the Popular Committees stated that the coalition has violated the ceasefire several times since its start in December 13. He also said they have evidence that the coalition is transferring Al-Qaeda and ISIS terrorists from Syria to use them as their proxies in their war against Ansar Allah as part of a two million-dollar agreement with the terrorists. On July 26, Saudi Arabia confirmed that Houthis hit a Saudi oil tanker off the western coast. Saudi energy minister announced on 26 July that the country temporarily ceases oil shipment through Bab-el-Mandeb straight after two Saudi vessels were hit by the Houthi movement. The decision led to increase in oil prices. The Houthi officials had earlier threatened that they would block the vital strait to force the coalition to stop its air strikes on Yemen. Mohammed al-Houthi said that they are able to reach high seas and Saudi ports but they want to keep the strait open in order not to give the coalition an excuse to justify their ongoing war. On July 27, Muhammed Abdel Salam, a senior Houthi spokesman warned that the coalition's cities would be targeted in response to their offense on Al Hudaydah stating: "From now on, the capitals of the Arab coalition members will no longer be safe". This followed Houthi's claim that they had targeted UAE international airport in Abu Dhabi, which was denied by UAE authorities. On 27 July, in response to the Houthi attack against two Saudi Arabia's oil tankers, the Saudi-led coalition intensified airstrikes on Houthi-controlled areas in Hodeidah, reportedly the airstrikes targeted military police headquarters and other bases controlled by the Houthi fighters in Hodeidah, causing damage to the city's infrastructure. As a result, dozens of families were forced to flee their homes following the intensive airstrikes. Houthis stated they would stop missile strikes at Saudi Arabia if Saudi-led coalition stopped their airstrikes against them. On 16 June, Martin Griffiths, the UN special envoy to Yemen, traveled to the Houthi-held capital Sanaa to persuade the Houthis to give up control of Al Hudaydah port amid growing fears that the battle will cut the only lifeline to the country's population. On 26 June, Martin Griffiths traveled to Aden to persuade Hadi for a political solution and to avert an assault on the city. The Houthis reportedly had shown willingness to hand over control of Al Hudaydah port to the UN but both Hadi and UAE insisted that the Houthis must relinquish control of the entire city. On 30 June, the coalition spokesman announced a temporary pause of the offensive for progress of political dialogue. However, Houthi spokesman, Abdl al-Salam called UAE's declaration of ceasefire "deception", saying that the assaults on the West coast has not stopped. Houthis deputy prime minister, Hussein Maqbuli, discussed in Sana with the UN coordinator, Lise Grande the conditions of over 24,000 internally displaced families in Yemen who according to Maqbuli were intimidated and compelled by the coalition to evacuate their villages and towns. On 30 January 2019, a UN de-mining team was fired on as they were trying to clear access to the Al Hudaydah grain silos, with both warring parties blaming each other for the incident. Reuters reported on 16 June that the battle led to the closure of the northern entrance of the western city Hodeidah, which leads to Sanaa, blocking a main exit out of the city and making it harder to transport goods from the country's largest port to mountainous regions. The pro-Hadi government minister of human rights denounced the Houthis tactics of planting sea and land mines around Al Hudaydah port. Houthi deputy prime minister claimed that the coalition has forced over 24000 families to evacuate their towns and villages. The battle forced about 2000 high-school students in Al Hudaydah to escape to Sanaa to take part in university admission exams, which was organized by the Houthis to alleviate social frustrations. UNICEF and UN Humanitarian Coordinator, stated that the coalition airstrikes on infrastructure and Houthi trench digging tactics which disrupt water pipes have put the lives of innocent civilians at risk and are undermining UN efforts to prevent further escalation of the humanitarian disaster, warning of a possibility of an uncontrollable cholera epidemic. CARE International warned that Yemeni food supplies might run out in two or three months if the Hodaida port is sealed off or put out of action. On November 7, Amnesty International stated that Houthi troops took up sniper position on top of May 22 hospital, violating international law and placing civilians inside in danger. On 26 January 2019 a fire caused by mortar shelling damaged two wheat silos in Al Hudaydah at the Red Sea Mills grains facility, which holds 51,000 tonnes of World Food Programme (WFP) wheat. Both warring parties blamed each other for the fire. The Red Sea Mills was previously reported to be in pro-coalition held territory during coalition forces advances prior to the ceasefire. Houthi leader Mohammed Ali al-Houthi blamed the assault on Western inaction, saying that the British assured them a week earlier that no coalition troops would attack Hudayda "without their agreement and assistance". Houthi spokesman Abdul Salem also stated that aggression in the West Coast "lacks moral and social values, so the aggressors resort to media show off and psychological warfare". Writing an op-ed in The Washington Post, Mohammed Ali al-Houthi, head of the Houthi-led Supreme Revolutionary Committee, stated the November escalation of war against Hudaida showed that US calls for peace were empty, misleading and only meant to save face after Khashoggi murder scandal, arguing that Trump administration is also interested in continuation of the war because of economic profits. He also said that the coalition is using famine and cholera as weapons of war and has undermined UN efforts for peace by threatening to cut its funding. He pointed to 2015 power-sharing deal by UN which was disrupted by the coalition airstrikes. He said that they would stop missile strikes at Saudi Arabia if Saudi-led coalition also stop their airstrikes against Yemen. "We love peace — the kind of honorable peace defended by our revolution’s leader, Abdulmalik al-Houthi. We are ready for peace, the peace of the brave. God willing, Yemenis will remain the callers of peace and lovers of peace," he said. The Iranian Ministry of Foreign Affairs strongly condemned the operation, claiming it would cause a humanitarian disaster. On 13 June 2018, the United Kingdom requested an emergency session of the United Nations Security Council to discuss the battle. More than forty members of the Parliament of the United Kingdom have called on Prime Minister Theresa May to call for a ceasefire and to stop supplying weapons to coalition nations if necessary. The session concluded with a rejection and opposition to call for a ceasefire and the immediate withdrawal of the Saudi led forces, but has instead urged sides to uphold international humanitarian law during the battle. Prior to the beginning of the fighting, members of the United States House of Representatives sent a letter to Secretary of Defense Mattis, urging the United States Department of Defense to attempt to prevent or delay the assault. The United States did not express opposition to the offense and has offered airstrike target assistance and qualified support, but noted increasing concerns regarding humanitarian consequences. UNICEF issued a warning that the attack could threaten the lives of 300,000 children in the populated area and prevent food delivery to as many as 250,000 of the 600,000 population of Al Hudaydah. However, the United Nations Security Council rejected a call for a ceasefire and the immediate withdrawal of the Saudi led forces, but has instead urged sides to uphold international humanitarian law during the battle. ^ a b c "Yemen: Coalition strikes continue to batter Houthi-held Hodeidah". Middle East Eye. 17 June 2018. Retrieved 22 June 2018. ^ "Humanitarian Crisis Worsens in Yemen After Attack on Port". Retrieved 17 June 2018. ^ "Battle starts for lifeline Yemen port". BBC News. 13 June 2018. Retrieved 17 June 2018. ^ a b "Hodeidah offensive paused as Houthis talk withdrawal". Middle East Eye. 1 July 2018. Retrieved 4 July 2018. ^ a b c d "Yemeni army seizes key Houthi supply routes into Hodeidah". www.aljazeera.com. Retrieved 6 November 2018. ^ "Yemen peace talks collapse in Geneva after Houthi no-show". /www.reuters.com. Retrieved 8 January 2019. ^ "Yemen: ceasefire agreed for port city of Hodeidah". www.theguardian.com. Retrieved 13 December 2018. ^ a b "Saudi-led forces seize airport in Yemen city of Hodeidah". Associated Press. Retrieved 16 June 2018. ^ "Saudi, UAE coalition enters airport compound of Yemen's Hudaida". Al Jazeera. Retrieved 21 June 2018. ^ "Saudi-led coalition seizes Yemen's Hodeidah airport, fears for population grow". Reuters. Retrieved 21 June 2018. ^ "Fog of war clouds Hodeidah airport as media disagree about who controls site". Retrieved 6 November 2018. ^ Fitch, Asa. "With Much at Stake in Yemen Port, Coalition Puts Advance on Hold". Retrieved 6 November 2018. ^ "Yemen: Coalition forces consolidate positions near Hodeidah Airport". 27 June 2018. Retrieved 6 November 2018. ^ "Tareq Saleh Leads 'Republican Guards' against Houthis on Yemen's West Coast". Asharq Al-awsat (in Ukrainian). Retrieved 15 June 2018. ^ a b c d e "Fog of war clouds Hodeidah airport as media disagree about who controls site". Middle East Eye. 22 June 2018. Retrieved 22 June 2018. ^ Mohammed Ghobari (20 June 2018). "Saudi-led coalition seizes Yemen's Hodeidah airport, fears for population grow". Reuters. Retrieved 22 June 2018. ^ "Yemen National Resistance, Brigades al-'Amalaqah and Tihama Forces prepare for massive military campaign to liberate Hodeidah from Houthi clutches". Emirates News Agency. ^ "قائد المقاومة التهامية لـ المدينة : نقترب من زبيد كبرى مدن الحديدة" [Leader of the Tihamah Resistance to al-Madina: We are approaching Zabid, the greater cities of Hodeidah]. al-Madina. 8 February 2018. Retrieved 11 February 2018. ^ "المقاومة التهامية : دور محوري للقوات الإماراتية في تحرير الساحل الغربي" [Tihamah Resistance: The Emirati Forces have a pivotal role in the liberation of the West Coast]. al Khaleej. 25 January 2018. Retrieved 11 February 2018. ^ "'Security Belt': The UAE's Tribal Counterterrorism Strategy in Yemen - Jamestown". ^ Georges Malbrunot Journaliste - Sa biographie. "Yémen : la France prête à déminer le port d'al-Hodeïda". Lefigaro.fr. Retrieved 17 June 2018. ^ a b "القوات البحرية تؤكد جهوزيتها العالية وتتوعد أي بارجة تهدد السواحل اليمنية". www.almasirah.net (in Arabic). Retrieved 14 June 2018. ^ a b c d "رئيس الثورية العليا يحمّل العدوان عواقب المساس بميناء الحديدة ويدعو المنظمات الدولية لاتخاذ موقف جاد". www.almasirah.net (in Arabic). Retrieved 14 June 2018. ^ a b Sondos Asem (21 June 2018). "What you need to know: The battle for Hodeidah". Middle East Eye. Retrieved 22 June 2018. ^ a b "Who are the Yemeni ground forces fighting in Hodeidah?". thenational.ae. 14 June 2018. ^ alaraby.co.uk (13 June 2018). "Four Emirati soldiers killed in Yemen: UAE". Al Araby. ^ "المسيرة نت صاروخ "توشكا" يضرب تجمعات الغزاة والمرتزقة في الساحل الغربي "محدّث"". Almasirah.net. Retrieved 17 June 2018. ^ "تدمير بارجة و331 آلية ومدرعة ومقتل وجرح مئات المرتزقة خلال 3 أسابيع من التصعيد في الساحل الغربي". www.almasirah.net (in Arabic). Retrieved 25 June 2018. ^ "مصرع أكثر من 50 مرتزقا وتدمير 18 آلية ومدرعة لقوى العدوان بالساحل الغربي". www.almasirah.net. Retrieved 6 November 2018. ^ a b c agencies, The New Arab &. "Yemeni civilian lives 'hang in balance' in Hodeida: UN". alaraby. Retrieved 13 December 2018. ^ "South Darfur receives bodies of 17 militiamen killed in Yemen - Sudan Tribune: Plural news and views on Sudan". sudantribune.com. Retrieved 13 December 2018. ^ a b "AFP.com". AFP.com. Retrieved 13 December 2018. ^ a b AFP (10 November 2018). "Fierce fighting for Hodeida leaves 110 Houthis, 22 pro-govt troops dead". DAWN.COM. Retrieved 13 December 2018. ^ a b "80 killed in armed confrontations, airstrikes in Yemen's Hodeidah: medics - Xinhua - English.news.cn". www.xinhuanet.com. Retrieved 13 December 2018. ^ a b c d "AFP.com". AFP.com. Retrieved 13 December 2018. ^ "A Saudi-led coalition warship was struck and 250 Houthi fighters were reportedly killed in assault on Yemeni city". ^ a b "84 dead in fighting in Yemen's Hodeidah after talks fail". Dhaka Tribune. 10 September 2018. Retrieved 13 December 2018. ^ a b "Dozens killed in air strikes and clashes in Yemen's Hodeidah". Middle East Eye. Retrieved 13 December 2018. ^ "Yemeni forces repel Houthi offensive on Kilo 16, killing 70 rebels". The National. Retrieved 13 December 2018. ^ agencies, The New Arab &. "Yemen rebels vow to fight on after losing Hodeida airport". Retrieved 6 November 2018. ^ "'The Yemen war death toll is five times higher than we think – we can't shrug off our responsibilities any longer'". Retrieved 6 November 2018. ^ "Saudi-led coalition reportedly halts fighting in Hodeidah ahead of peace talks". Middle East Eye. Retrieved 13 December 2018. ^ a b c d Wintour, Patrick (14 June 2018). "Pro-government forces 'breach defences' at crucial Yemen port". The Guardian. ^ a b c d Ghobari, Mohammed; Mokashef, Mohamed; Shalal, Andrea; Miles, Tom. Lawrence, Janet (ed.). "Civilians flee bombardment as Arab states pound Yemen port". Reuters. Coalition spokesman Turki al-Malki has said operation "Golden Victory" aimed to wrest control of the port and airport, but that troops would avoid entering the city. ^ "Saudi Arabia, UAE, launch attack on Yemen's port city of Hudaida". Al Jazeera English. 13 June 2018. ^ a b c d Nissenbaum, Dion; Stancati, Margherita (13 June 2018). "Yemeni Forces, Backed by Saudi-Led Coalition, Launch Assault on Country's Main Port". The Wall Street Journal. Archived from the original on 13 June 2018. ^ a b Ghobari, Mohammed. "Arab states launch biggest assault of Yemen war with attack on main..." U.S. Retrieved 14 June 2018. ^ a b c McVeigh, Karen (13 June 2018). "Yemen port city gripped by panic and fear as Saudi-led forces close in". The Guardian. ^ a b c "Assault on key Yemeni port would endanger 300,000 children and 'choke off' aid for millions more: UNICEF chief". UN News. 12 June 2018. Retrieved 14 June 2018. ^ "AU.N. In Talks To Take Over Administration Of Strategic Yemeni Port City". Kaiser Family Foundation. 18 June 2018. Retrieved 18 June 2018. ^ "Houthis refuse to withdraw from Yemen's Hodeidah". The National. 18 July 2018. ^ "Saudi-led coalition masses troops for push on Yemen's Hodeidah". Reuters. 14 May 2018. ^ a b "Humanitarian Crisis Worsens in Yemen After Attack on Port". Retrieved 3 July 2018. ^ a b c "Deputy PM, UN Humanitarian Coordinator discuss IDPs situation in Hodeidah". Saba Net. 2 July 2018. ^ a b c d e Ghobari, Mohammed. "Arab alliance close to capturing Hodeidah airport, Yemen military says". U.S. Retrieved 16 June 2018. ^ a b "Access to water continues to be jeopardized for millions of children in war-torn Yemen". www.unicef.org. Retrieved 26 July 2018. ^ a b Salisbury, Peter (27 June 2018). "The New Front in Yemen". Foreign Affairs. ^ a b "Al-Ḥudaydah". britannica. Retrieved 23 July 2018. ^ "Where is Al Hudaydah, Yemen?". world atlas. Retrieved 23 July 2018. ^  : "UN: Saudi Blockade of Yemen's Ports Causing Humanitarian Catastrophe"
^ a b Emmons, Alex (16 June 2018). "THE U.S. IS EXACERBATING THE WORLD'S WORST HUMANITARIAN CRISIS BY OUTSOURCING ITS YEMEN POLICY". The Intercept. Retrieved 21 June 2018. ^ a b c d "Why is fighting over Yemeni city Hodeidah so important?". The Independent. Retrieved 14 June 2018. ^ Erickson, Amanda (22 November 2017). "Saudi Arabia just reopened two key ports in Yemen. That won't prevent a famine". Washington Post. Retrieved 25 November 2017. ^ Ghobari, Mohammed. "Yemenis who fled battle for Hodeidah struggle to survive". U.S. Retrieved 13 July 2018. ^ a b c d e f Nissenbam, Dion. "U.S. Deepens Role in Yemen Fight, Offers Gulf Allies Airstrike-Target Assistance". The Wall Street Journal. Archived from the original on 13 June 2018. ^ "PressTV-UN 'deeply concerned' about Saudi Hudaydah aggression". Retrieved 18 June 2018. ^ "Assault on key Yemeni port would endanger 300,000 children and 'choke off' aid for millions more: UNICEF chief". UN News. 12 June 2018. Retrieved 18 June 2018. ^ a b "ناطق أنصار الله: مالم يستطع العدو أخذه بالقوة لن يأخذه عن طريق المبعوث الأممي". Almasirah. ^ a b c d "Arab-led forces begin assault on Hudaida". The Daily Star. Associated Press. 13 June 2018. ^ "As Saudis Go to War, the Crown Prince Attends a Soccer Match". New York Times. 14 June 2018. Retrieved 15 June 2018. ^ "هل يستطيع التحالف السعودي احتلال الحُديدَة؟". شبكة الميادين (in Arabic). 13 June 2018. Retrieved 14 June 2018. ^ "انصارالله: توقف تجاوزگری علیه الحدیده دروغ است/ متجاوزان به‌دنبال راه‌حل سیاسی نیستند - اخبار تسنیم - Tasnim". خبرگزاری تسنیم - Tasnim (in Persian). Retrieved 3 July 2018. ^ Fitch, Asa; al-Batati, Saleh (8 July 2018). "With Much at Stake in Yemen Port, Coalition Puts Advance on Hold". The Wall Street Journal. Archived from the original on 8 July 2018. Retrieved 8 July 2018. Frequent Houthi attacks along the windswept, largely barren coastal road to Hodeidah, passing through al-Khokha, where the U.A.E. maintains a forward base, have presented another challenge. ^ McFarland, Susan (13 June 2018). "Saudi coalition strikes kill 250 Houthi combatants in heavy fighting". UPI. ^ "Four 4 UAE soldiers killed in Battle of Hodeidah in Yemen – UAE Armed Forces". Arab News. 13 June 2018. The UAE General Command of the Armed Forces announced four of its brave soldiers have been killed while carrying out their national duty in the process of "restoring hope" within the Arab coalition forces led by Saudi Arabia to support the legitimacy in Yemen. The soldiers include Lt. Khalifa Khalifa Saif Saeed Al-Khatiri, Ali Mohammed Rashid Al-Hassani, Sergeant Khamis Abdullah Khamis Al-Zuwaidi and Corporal Obaid Hamdan Saeed Al-Abdouli. ^ "الحوثي: إسرائيل ترى السيطرة على الساحل الغربي هدفاً استراتيجياً". شبكة الميادين (in Arabic). 14 June 2018. Retrieved 14 June 2018. ^ al-Haidari, Fawaz; Meuse, Alison Tahmizian (13 June 2018). "Battle for key Yemen port leaves dozens dead". Yahoo News. The Houthis suffered 30 fatalities on Thursday in clashes near Hodeida airport south of the city, medical sources told AFP. ^ al-Sufyan, Hani; Seif, Islam (14 June 2018). "Top Houthi commanders killed in Hodeidah, several mines extracted from Saada". Al Arabiya. ^ a b "The Latest: UAE says delivering aid to Yemen's Hodeida". Washington Post. Retrieved 17 June 2018. ^ "صاروخ "توشكا" يضرب تجمعات الغزاة والمرتزقة في الساحل الغربي "محدّث"". www.almasirah.net (in Arabic). Retrieved 16 June 2018. ^ "اليمن: ابتسام المتوكل: زرنا مطار #الحديدة وأؤكد أن الجيش اليمني واللجان الشعبية هي التي تسيطر عليه". شبكة الميادين (in Arabic). 16 June 2018. Retrieved 16 June 2018. ^ "اليمن: مصادر للميادين: التحالف السعودي وحلفاؤه فشلوا في السيطرة على #الحديدة وباتوا عند الساحل الغربي". شبكة الميادين (in Arabic). 16 June 2018. Retrieved 16 June 2018. ^ "قطع امدادات العدوان في الساحل الغربي من ثلاثة محاور". www.alalam.ir. Retrieved 16 June 2018. ^ "مصرع عشرات المنافقين بعمليات قنص في جبهات الحدود والداخل". www.almasirah.net (in Arabic). Retrieved 16 June 2018. ^ "Yemen: Houthis threaten to blow up Hodeidah airport terminals". The National. Retrieved 30 June 2018. ^ Ghobari, Mohammed. "Saudi-led coalition storms Yemen's Hodeidah airport compound". U.S. Retrieved 20 June 2018. ^ "Saudi-led coalition seizes large areas of Yemen's Hodeidah airport:..." CNBC. Retrieved 20 June 2018. ^ "عشرات القتلى والجرحى من قوى العدوان وتدمير 20 آلية واغتنام 10 بالساحل الغربي". www.almasirah.net (in Arabic). Retrieved 20 June 2018. ^ "صور | استشهاد 6 مواطنين بينهم 4 نساء في غارة للعدوان بالحديدة (محدّث)". www.almasirah.net (in Arabic). Retrieved 20 June 2018. ^ "'No civilian casualties in Hodeidah Airport battle,' Col. Malki tells Al Arabiya". Al Arabiya. Retrieved 20 June 2018. ^ "With Hodeidah airport liberated, Saudi Arabia-led coalition accuses Houthis of targeting civilians". Arab News. Retrieved 20 June 2018. ^ "الجبهة الوطنية الجنوبية: ما يجري في الساحل الغربي امتداد للأطماع الدولية". www.almasirah.net (in Arabic). Retrieved 20 June 2018. ^ "صاروخ باليستي يستهدف قوات هادي والتحالف السعودي في جبهة الساحل الغربي". شبكة الميادين (in Arabic). 20 June 2018. Retrieved 20 June 2018. ^ Fitch, Asa (20 June 2018). "Saudi Coalition Beats Back Houthi Rebels From Hodeidah Airport". Wall Street Journal. ISSN 0099-9660. Retrieved 20 June 2018. ^ "As Hodeidah battle grinds on, residents suffer lack of clean water, electricity". Reuters. Retrieved 23 June 2018. ^ "التنكيل بالمرتزقة خلال محاولة تقدم فاشلة باتجاه محيط مطار الحديدة". www.almasirah.net (in Arabic). Retrieved 22 June 2018. ^ "Yemeni government and Houthi militias invited to Sept 6 Geneva peace talks". www.almasirah.net. Retrieved 14 September 2018. ^ "Yemen airstrikes kill nearly 30 people and WHO warns of new cholera outbreak". The Independent. Retrieved 5 August 2018. ^ "Saudis foil Al Houthi boat attack in Red Sea". Gulf News. Retrieved 28 August 2018. ^ Staff, Writer. "Yemen: 19 fishermen missing after Saudi airstrike". presstv. Retrieved 31 August 2018. ^ "Fishermen in Hodeidah reportedly targeted by Saudi-UAE air raid". aljazeera. Retrieved 31 August 2018. ^ "Yemen peace talks collapse in Geneva after Houthi no-show". Reuters. 8 September 2018. Retrieved 14 September 2018. ^ "Al Houthi delays may lead to collapse of Geneva talks". Gulf News. 7 September 2018. Retrieved 14 September 2018. ^ "73 Al Houthis killed in Hodeida". Gulf News. Retrieved 10 September 2018. ^ "Yemeni army advances in Hodeidah, Houthi supply commander killed in battles". english.alarabiya.net. Retrieved 6 November 2018. ^ "Airstrikes, heavy fighting resume in Hudaida". 13 September 2018. Retrieved 6 November 2018. ^ "Yemeni Troops Advance, Enter Hodeidah University". Ashraq Al-Awsat. Retrieved 15 September 2018. ^ "Saudi airstrike kills 19 civilians, including children, near Yemeni city of Hodeida". The Independent. 25 October 2018. Retrieved 13 December 2018. ^ "Arab coalition to send 10,000 troops to liberate Hodeidah from Houthis". The National. 1 November 2018. ^ "Yemen – Conflict (DG ECHO, UN, NGOs, media)(ECHO Daily Flash of 7 November 2018)". ReliefWeb. 7 November 2018. On 3 November, 200 air strikes were reported in and around Hodeidah alone. Fighting was particularly intense around the airport, to the east of the city and near a university to the west, 4 km south of the port. ^ a b c "Yemen war: Battle for vital port of Hudaydah intensifies". BBC News. 7 November 2018. ^ "Conflict in Yemen: "A living hell for children"". www.unicef.org. Retrieved 12 November 2018. ^ Save the Children Yemen [@SaveChildrenYE] (7 November 2018). "Save the Children is deeply concerned for the wellbeing of civilians trapped inside #Hodeidah and urges the warring parties to stop the fighting immediately and seek a political solution to this brutal conflict. The UN Security Council must make this a reality" (Tweet) – via Twitter. ^ Fore, Henrietta (6 November 2018). "Yemen: Children in Hudaydah hospital at imminent risk of death". UNICEF. “Intense fighting in the Yemeni port city of Hudaydah is now dangerously close to Al Thawra hospital - putting the lives of 59 children, including 25 in the intensive care unit, at imminent risk of death. ^ McKernan, Bethan (7 November 2018). "Battle rages in Yemen's vital port as showdown looms". The Guardian. ^ "Yemen government announces new push to seize key port, U.N. warns..." 9 November 2018. Retrieved 13 December 2018 – via www.reuters.com. ^ "New War Crime, US-Saudi Aggression Targets Hospitals in Hodiedah". english.almasirah.net. Retrieved 13 December 2018. ^ "Yemeni forces 'seize Hodeidah's main hospital' amid air raids". Al Jazeera. 10 November 2018. Retrieved 10 November 2018. ^ Agence France-Presse (11 November 2018). "Yemen forces seize hospital in Hodeida". Khaleej Times. Yemeni officials said on Saturday that pro-government forces had captured the May 22 Hospital. Amnesty International had accused the Houthis of "deliberate militarisation" of the facility after they posted snipers on its roof. ^ "Yemen's Houthi rebels arrest "Sudanese soldiers" fighting for Saudi-led coalition". Xinhua News Agency. 11 November 2018. Yemen's Houthi rebels on Saturday said they have arrested dozens of "Sudanese soldiers" who fought for the Saudi-led coalition forces against the Houthi fighters in the Yemeni war-torn Red Sea port city of Hodeidah. ^ Yemen Observer [@YemenObserv] (10 November 2018). "For the first time in this war, Houthi fighters captivated Sudanese soldiers" (Tweet) – via Twitter. ^ "PressTV-Yemen war: Saudi-led push to invade Hudaydah repelled". www.presstv.com. Retrieved 13 December 2018. ^ al-Jaber, Mariam (10 November 2018). "Yemeni minister of information defects from Houthi coup government". Al Arabiya English. Jaber is said to have been in the Saudi capital of Riyadh since two days ago and is set to hold a morning press conference at 10 am local time on Sunday, the source confirmed. ^ "Reporter throws shoe at Al Houthi minister who defected to Saudi Arabia". gulfnews.com. Retrieved 13 December 2018. ^ a b c McKernan, Bethan; Wintour, Patrick (15 November 2018). "Yemen: Saudi-led coalition orders halt to Hodeidah offensive". The Guardian. ^ Ghobari, Mohammed; El Taakoubi, Aziz; Sennero, Johan; Alsharif, Asma (15 November 2018). Ghantous, Ghaida; Kasolowsky, Raissa (eds.). "Saudi-led coalition halts Hodeidah assault as West presses for Yemen ceasefire: sources". Reuters. ^ a b The Associated Press (20 November 2018). "Yemen: fighting returns to Hodeidah despite UN ceasefire calls". The Guardian. ^ Ghantous, Ghaida (19 November 2018). Henrich, Mark (ed.). "Clashes, air strikes resume in Yemen's Hodeidah - residents". Reuters. They said the Saudi-led coalition carried out more than 10 air strikes and that fierce battles could be heard on the edges of the Houthi-held city, four km (2.5 miles) away from its port. One resident said a medium-range missile had been fired from the city centre towards the “July 7” district where ground fighting was raging. ^ a b "Yemen: 85,000 children may have died from starvation". Al Jazeera English. 20 November 2018. ^ "Millions of Yemenis Prepare to Commemorate Birth of Prophet Mohammed". english.almasirah.net (in Arabic). Retrieved 24 November 2018. ^ "PressTV-Yemenis mark Prophet Muhammad's birth anniversary". Retrieved 24 November 2018. ^ "PressTV-Houthi: Yemen is now at important, decisive stage". Retrieved 24 November 2018. ^ "Yemeni army soldiers, allies intercept, shoot down Saudi-led combat drone in Hudaydah". Press TV. 22 November 2018. Archived from the original on 22 November 2018. An unnamed Yemeni military source told Arabic-language al-Masirah television network that Yemeni air defense forces and their allies shot down the combat drone as it was on a mission over the mountainous Jabaliya area on Thursday evening. ^ "UN envoy arrives in Hodeidah to plan fresh Yemen peace talks". Al Jazeera English. 23 November 2018. ^ "Saba Net - Yemen news agency". www.sabanews.net. Retrieved 13 December 2018. ^ Agence France-Presse (3 December 2018). "UN plane evacuates wounded Houthis". The Hindu. Fifty wounded rebels will be evacuated from the Yemeni capital for medical treatment on Monday, a Saudi-led military coalition said, as the UN envoy landed in Sana’a ahead of planned peace talks in Sweden. ^ Wintour, Patrick (3 December 2018). "Yemen: injured Houthi rebels evacuated, raising hope of peace talks". The Guardian. A plane carrying 50 wounded Houthi rebel fighters has left the Yemeni capital Sana’a in a critical confidence-building measure before peace talks can get under way in Stockholm as early as Wednesday. ^ "العميد يحيى سريع: أي اعتداء بحري سيقابَل بمفاجآت غير محسوبة". الأخبار (in Arabic). Retrieved 27 December 2018. ^ Editorial, Reuters. "Yemen's Houthis hit Saudi oil tanker causing slight damage: Saudi TV". U.S. Retrieved 26 July 2018. ^ Editorial, Reuters. "Saudi Arabia suspends oil exports through Bab El-Mandeb after..." U.S. Retrieved 26 July 2018. ^ Sheldrick, Aaron. "Oil prices rise as Saudi Arabia suspends shipments through Red Sea..." U.S. Retrieved 26 July 2018. ^ Gamal, Rania El. "Saudi Arabia suspends oil exports through Red Sea lane after Houthi..." U.S. Retrieved 26 July 2018. ^ Sputnik. "Houthis to Saudi-Led Arab Coalition: 'From Now On, Your Capitals No Longer Safe'". sputniknews.com. Retrieved 30 July 2018. ^ "Saudi-led coalition intensifies airstrikes against Houthis in Yemen's Hodeidah - Xinhua | English.news.cn". www.xinhuanet.com. Retrieved 30 July 2018. ^ a b "Opinion | Houthi leader: We want peace for Yemen, but Saudi airstrikes must stop". Washington Post. Retrieved 12 November 2018. ^ Mokhashef, Mohamed. "U.N. envoy resumes talks to avert all-out attack on Yemen's main port". U.S. Retrieved 29 June 2018. ^ Editorial, Reuters. "UAE says pauses Hodeidah offensive for U.N. Yemen peace efforts". U.S. Retrieved 3 July 2018. ^ "'UAE Embarrassed, Wants to Deceive Public Opinion over Hodeidah Aggression'". english.almasirah.net (in Arabic). Retrieved 4 July 2018. ^ "Deminers attacked near grain stores in Yemen port". Reuters. 30 January 2019. ^ "Yemen's Houthi rebels committing war crimes in Hodeidah, human rights minister says". The National. Retrieved 29 June 2018. ^ Al-Ansi, Abdulrahman. "War forces Yemen high school students to flee to capital to take exams". U.S. Retrieved 4 July 2018. ^ a b "Civilians at extreme risk from airstrikes in Hodeidah [EN/AR]". ReliefWeb. Retrieved 30 July 2018. ^ "هل هُناك عَلاقة بين هُجوم الحوثيين على نَاقِلَة نِفط سُعوديّة في البَحر الأحمر وتَهديد إيران بإغلاق مَضيق هرمز؟ ولماذا تتزايَد تسريبات الإمارات حَول نواياها بسَحبِ قُوّاتِها مِن اليَمن هَذهِ الأيّام؟ وكيف نُفَسِّر الصَّمت السُّعوديّ تُجاهَها؟". رأي اليوم. Retrieved 26 July 2018. ^ "Yemen's food supplies might run out in two months, charity warns". The Independent. Retrieved 1 October 2018. ^ "Yemen war: Houthi rebels 'militarising' hospitals, warns Amnesty". Amnesty International. 7 November 2018. Retrieved 10 November 2018. ^ "Yemen: Huthi gunmen raid hospital as Hodeidah's civilians face imminent onslaught". The Independent. 8 November 2018. Retrieved 10 November 2018. ^ "Fire damages vital wheat silos in Yemen's Hodeidah - U.N." Reuters. 26 January 2019. ^ "Fighting in Yemen city of Hodeidah reaches residential streets". The Guardian. ^ "Iran condemns UAE-led assault against key Yemeni port city". Press TV. 14 June 2018. Archived from the original on 14 June 2018. Retrieved 14 June 2018. ^ "Nasrallah: Arabs should unite to attack Israel, not Yemen". Retrieved 1 July 2018. ^ Agence France-Presse (13 June 2018). "Britain requests UN Security Council meeting on Yemen port offensive". Arab News. Britain on Wednesday requested an urgent UN Security Council meeting after Yemen government forces backed by the Saudi-led coalition launched an offensive on the key port of Hodeida, diplomats said. ^ a b "UK opposes immediate ceasefire in Yemen port of Hodeidah at UN as coalition forces close in". Telegraph. 15 June 2018.